There are only a few days left before Aylesham’s carnival and fete takes place on Saturday 22 September – so now is the time to get your name down if you want to take part! The fete will start at 12pm while the carnival will assemble at Boulevard Courrieres during the afternoon, moving off from there at 5pm following the same route around Aylesham as last year. Carnival court manager Kerrylyn James said: “The association has had a whirlwind of a ride this year but it has been a good one all the same and we have made many friends far and near at the events the girls have been to. “So many people have pitched in to help and we thank them all for doing so – Bob and Dave for keeping the float on the road and driving it to and from events; to Dan, Sarah and Carla for updating the website, the Ritson family for their continued support and sponsorship, along with all our other sponsors who have donated to help meet our costs. “We were delighted to raise nearly £1,000 as well from local residents after our door knocking evenings a few weeks ago – people have been very generous. “We want to see as many people as possible take part in our carnival this time. Nicole and her princesses have won several awards at the carnivals they have attended this summer including Queen of Queens and best float trophies and certificates. First places can be viewed in a brimming display case at Jam & Roses Coffee Shop in Cornwallis Avenue, run by Adina Plews, one of the sponsors. As well as these, the girls have won numerous second and third places and will be presented with them in their memory books at the end of the year in February, when they stand down. Nicole hopes to see you all at the fete and carnival and to come out to support the village. Also be sure to give everyone in the parade a big wave and a big smile! 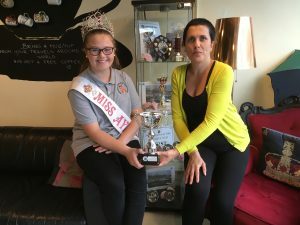 *One of the most recent awards went to princess Charlotte O’Sullivan who was crowned Kent Coal Queen 2018 at the Miners’ Festival in Betteshanger, held on August Bank Holiday Monday.